Gastrointestinal bleeding: from conventional to nonconventional! Recent advances in pharmacologic, radiologic, and endoscopic management of gastrointestinal bleeding has improved the ability to achieve hemostasis and prevent re-bleeding. However, this improvement in hemostatic capability has failed to significantly improve the overall mortality in patients with gastrointestinal bleeding. Today gastroenterologists are facing this stiff challenge. 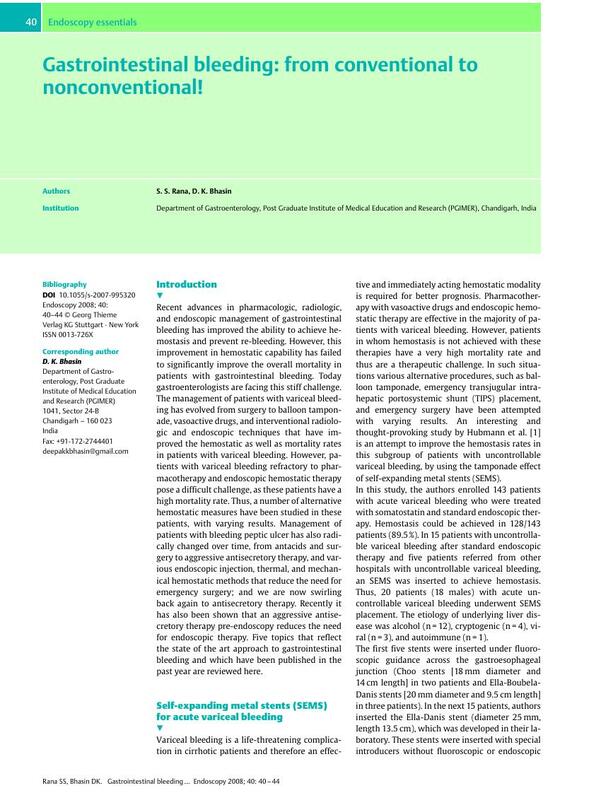 The management of patients with variceal bleeding has evolved from surgery to balloon tamponade, vasoactive drugs, and interventional radiologic and endoscopic techniques that have improved the hemostatic as well as mortality rates in patients with variceal bleeding. However, patients with variceal bleeding refractory to pharmacotherapy and endoscopic hemostatic therapy pose a difficult challenge, as these patients have a high mortality rate. Thus, a number of alternative hemostatic measures have been studied in these patients, with varying results. Management of patients with bleeding peptic ulcer has also radically changed over time, from antacids and surgery to aggressive antisecretory therapy, and various endoscopic injection, thermal, and mechanical hemostatic methods that reduce the need for emergency surgery; and we are now swirling back again to antisecretory therapy. Recently it has also been shown that an aggressive antisecretory therapy pre-endoscopy reduces the need for endoscopic therapy. Five topics that reflect the state of the art approach to gastrointestinal bleeding and which have been published in the past year are reviewed here.